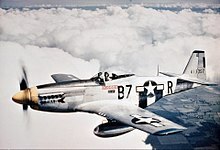 The United States Army Air Forces (USAAF or AAF), informally known as the Air Force,or United States Army Air Force, was the aerial warfare service component of the United States Army during and immediately after World War II (1939/41–1945), successor to the previous United States Army Air Corps and the direct predecessor of the United States Air Force of today, one of the five uniformed military services. The AAF was a component of the United States Army, which in 1942 was divided functionally by executive order into three autonomous forces: the Army Ground Forces, the Services of Supply (which in 1943 became the Army Service Forces), and the Army Air Forces. Each of these forces had a commanding general who reported directly to the Army Chief of Staff. 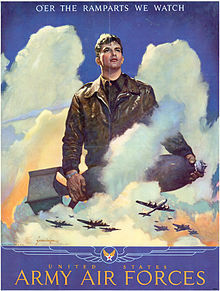 The Army Air Forces was created in June 1941 to provide the air arm a greater autonomy in which to expand more efficiently, to provide a structure for the additional command echelons required by a vastly increased force, and to end an increasingly divisive administrative battle within the Army over control of aviation doctrine and organization that had been ongoing since the creation of an aviation section within the U.S. Army Signal Corps in 1914. The AAF succeeded both the Air Corps, which had been the statutory military aviation branch since 1926, and the GHQ Air Force, which had been activated in 1935 to quiet the demands of airmen for an independent Air Force similar to the Royal Air Force which had already been established in the United Kingdom / Great Britain. Although other nations already had separate air forces independent of their army or navy (such as the British Royal Air Force and the German Luftwaffe), the AAF remained a part of the Army until a defense reorganization in the post-war period resulted in the passage by the United States Congress of the National Security Act of 1947 with the creation of an independent United States Air Force in September 1947. In its expansion and conduct of the war, the AAF became more than just an arm of the greater organization. By the end of World War II, the Army Air Forces had become virtually an independent service. By regulation and executive order, it was a subordinate agency of the United States Department of War (as were the Army Ground Forces and the Army Service Forces) tasked only with organizing, training, and equipping combat units, and limited in responsibility to the continental United States. In reality, Headquarters AAF controlled the conduct of all aspects of the air war in every part of the world, determining air policy and issuing orders without transmitting them through the Army Chief of Staff. This "contrast between theory and fact is...fundamental to an understanding of the AAF." The Air Corps at the direction of President Roosevelt began a rapid expansion from the spring of 1939 forward, partly from the Civilian Pilot Training Program created at the end of 1938, with the goal of providing an adequate air force for defense of the Western Hemisphere. An initial "25-group program", announced in April 1939, called for 50,000 men. However, when war broke out in September 1939 the Air Corps still had only 800 first-line combat aircraft and 76 bases, including 21 major installations and depots. American fighter aircraft were inferior to the British Spitfire and Hurricane, and German Messerschmitt Bf 110 and 109. Ralph Ingersoll wrote in late 1940 after visiting Britain that the "best American fighter planes already delivered to the British are used by them either as advanced trainers—or for fighting equally obsolete Italian planes in the Middle East. That is all they are good for." RAF crews he interviewed said that by spring 1941 a fighter engaging Germans had to have the capability to reach 400 mph in speed, fight at 30,000–35,000 feet, be simple to take off, provide armor for the pilot, and carry 12 machine guns or six cannons, all attributes lacking in American aircraft. The Air Corps Act of July 1926 increased the number of general officers authorized in the Army's air arm from two to four. The activation of GHQAF in March 1935 doubled that number to eight and pre-war expansion of the Air Corps in October 1940 saw fifteen new general officer billets created. [n 21] By the end of World War II, 320 generals were authorized for service within the wartime AAF. In addition to the construction of new permanent bases and the building of numerous bombing and gunnery ranges, the AAF utilized civilian pilot schools, training courses conducted at college and factory sites, and officer training detachments at colleges. In early 1942, in a controversial move, the AAF Technical Training Command began leasing resort hotels and apartment buildings for large-scale training sites (accommodation for 90,000 existed in Miami Beach alone). The leases were negotiated for the AAF by the Corps of Engineers, often to the economic detriment of hotel owners in rental rates, wear and tear clauses, and short-notice to terminate leases. In the first half of 1942 the Army Air Forces expanded rapidly as the necessity of a much larger air force than planned was immediately realized. Authorization for the total number of combat groups required to fight the war nearly doubled in February to 115. In July it jumped to 224, and a month later to 273. When the U.S. entered the war, however, the number of groups actually trained to a standard of combat proficiency had barely surpassed the total originally authorized by the first expansion program in 1940. The extant training establishment, in essence a "self-training" system, was inadequate in assets, organization, and pedagogy to train units wholesale. Individual training of freshly minted pilots occupied an inordinate amount of the available time to the detriment of unit proficiency. The ever-increasing numbers of new groups being formed had a deleterious effect on operational training and threatened to overwhelm the capacity of the old Air Corps groups to provide experienced cadres or to absorb graduates of the expanded training program to replace those transferred. Since 1939 the overall level of experience among the combat groups had fallen to such an extent that when the demand for replacements in combat was factored in, the entire operational training system was threatened. Actually, the Commanding General, Army Air Forces ... functioned on a level parallel to that of the Chief of Staff. ... He moved at the very highest levels of command in the wartime coalition with Britain. 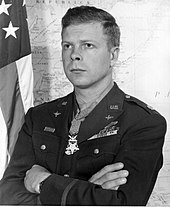 He chose the commanders of the combat air forces. ... He communicated regularly (with the air commanders overseas). ... He exerted a powerful influence on the development of strategy, tactics, and doctrine wherever AAF units fought. ... A world-wide system of air transport moved at his command through all theaters, (denying their) commanders their traditional prerogative of controlling everything within their area of responsibility. Throughout the war (he ran) the air war in whatever part of the world there seemed to be need for attention by Headquarters. The contrast between theory and fact is...fundamental to an understanding of the AAF. USAAF uniforms for all members consisted of a winter service uniform of olive drab wool worn in temperate weather and a tropical weather summer service uniform of khaki cotton the same as those of other U.S. Army forces. In addition to the service uniforms usually worn for dress purposes and on pass from posts there were a variety of fatigue and flying uniforms. Summer and winter service uniforms were both worn throughout the year in the continental U.S. During World War II the European theater of operations was considered a year-round temperate uniform zone and the Pacific theater of operations a year-round tropical uniform zone. As all 48 states then part of the Union were contained within the contiguous United States, the term "Zone of the Interior" for the First through Fourth Air Forces' areas of assignment was the Second World War's term for what is called "CONUS" by today's United States Department of Defense in the 21st century. ^ These staff positions were designated A-1 through A-5 and corresponded to the WDGS positions of G-1 through G-5. The AAF began the war with this air staff but replaced it in the March 1942 reorganization. ^ The Air Corps itself was a statutory entity and could not be legally discontinued except by act of Congress, but executive abolition of the OCAC under authority of the First War Powers Act gave the AAF legal standing. The chiefs of the other combat arms, including Infantry, were also abolished. 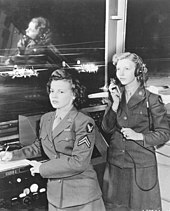 ^ Management Control coordinated all the other directorates through the activities of organizational and legislative planning, statistical control, and the Adjutant General, who under the operating staff system was chief of administrative services rather than the issuer of orders and directives as he had been under the Chief of the Air Corps. ^ MM&D became "Materiel and Services" (M&S) on 17 July 1944 in conjunction with the planned consolidation of the Air Materiel and Air Service Commands. ^ "Commitments" would be consolidated as part of AC/AS, Plans. ^ By 1945 the term had also found its way into feature cinema, such as "They Were Expendable", in which a naval officer (John Wayne) and an AAF pilot (Louis Jean Heydt) chide each other about lack of reinforcement from their respective services. 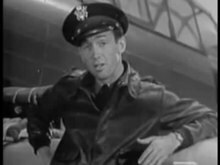 Wayne's character asks, "And where is the Air Force?" ^ First line combat aircraft in July 1944 totaled 492 very heavy bombers; 10,431 heavy bombers; 4,458 medium bombers; 1,733 light bombers; 14,828 fighters; and 1,192 reconnaissance aircraft. The most numerous individual types were the B-24 Liberator (5,906), P-47 Thunderbolt (5,483), B-17 Flying Fortress (4,525), and C-47 Skytrain (4,454). ^ V Air Support Command was one of five organizations created in September 1941. Its responsibility was to direct and coordinate the training activities of National Guard observation squadrons inducted into federal service with those of light bomber units training with the Army Ground Forces. It was not a part of or related to any "numbered air force" but part of Air Force Combat Command, the former GHQ Air Force. It became superfluous for its purpose and was discontinued in April 1942, redesignated "9th Air Force" as the basis for the future tactical air force. ^ The U.S. Strategic Air Forces was created in February 1944 from the headquarters of the previous Eighth Air Force, the designation of which was then given to its former VIII Bomber Command. In August 1945, USSTAF became the United States Air Forces in Europe (USAFE). ^ The Fifteenth Air Force organized a temporary fighter headquarters in August 1944 when it created a provisional fighter wing to separate control of its P-38 groups from its P-51 groups. This headquarters was referred to as "XV Fighter Command (Provisional)". 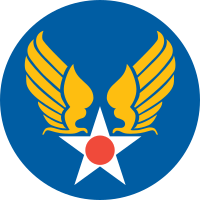 ^ Established 31 August 1944 as the AAF Technical Service Command to replace both Air Materiel and Air Service Commands, and renamed Air Technical Service Command in July 1945. ^ Generally, very heavy bombardment (B-29) and fighter groups had three flying squadrons assigned while all other types had four. Composite groups had as few as two (509th Composite) and as many as six fying squadrons (the three air commando groups). 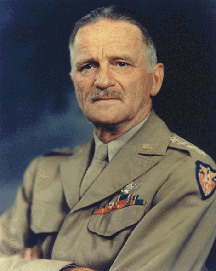 ^ Spaatz calculated combat-ready groups, both overseas and in the strategic reserve, at 43.5 at the end of January 1942. 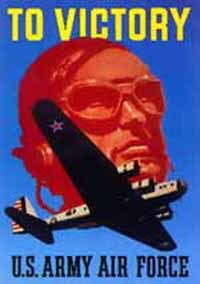 ^ In May 1942 "transport" became the designation for non-combat groups that were part of Air Transport Command. ^ The 497th, 498th, and 500th BGs of the 73rd Bomb Wing. They were trained by the last active B-29 OTU, the 472nd BG. ^ The 419th TCG was not a flying unit but managed transportation terminals in the Pacific. 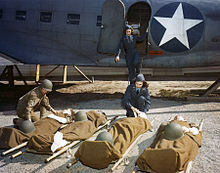 The four combat cargo groups, numbered 1–4, served in the CBI and 5AF in 1944–45. Two were later redesignated troop carrier groups and became part of the USAF. ^ The totals include 12 designated reconnaissance groups plus the 25h Bomb Group (Recon). ^ The five composite groups were the 509th CG (B-29/C-54), 28th BG (B-24/B-25), and the 1st, 2nd and 3rd Air Commando Groups. The air commando groups were created for service in the CBI and 5AF with one troop carrier, two reduced-strength fighter, and three liaison squadrons each. (AAF Statistical Digest, p. 2) A medium bomb group, the 477th BG, converted to a P-47/B-25 composite group in June 1945. ^ The 1226 figure is for TO&E squadrons only. Not included in the total of flying squadrons are more than 100 Air Transport Command, advanced flight training, and flexible squadrons of AAF Base Units between 1 August 1944 and the end of the war. ^ Spitfire Mk.Vs equipped the 4th Fighter Group until early 1943; Mk.Vs and Mk.IXs were the primary fighter of the 31st and 52nd FGs until 1944. (Maurer Combat Units, pp. 35, 84, and 114). ^ However, the 115,000 battle casualties suffered by the AAF represented 19% of the 603,000 aircrew trained during the war. ^ Installations closed because of demobilization included main bases, sub (satellite) bases, and auxiliary airfields. ^ The commanders L-R are Brig. Gen. Jesse D. Auton (65th FW), Gen. Dwight D. Eisenhower (SHAEF), Lt. Gen. Carl A. Spaatz (USSTAFE), Lt. Gen. James H. Doolittle (8th AF), Brig. Gen. William Kepner (VIII FC), and Col. Donald Blakeslee (4th FG). ^ The Air Corps became a subordinate component of the Army Air Forces on 20 June 1941, and was abolished as an administrative organization on 9 March 1942. It continued to exist as one of the combat arms of the Army (along with infantry, armor, and artillery) until abolished by reorganization provisions of the National Security Act of 1947 (61 Stat. 495), 26 July 1947. ^ The Army Air Forces were abolished by Transfer Order 1, Office of the Secretary of Defense, 26 September 1947, implementing the same provisions. Transfer Order 1 was the first of 200 Army-Air Force transfer agreements drawn up in June and July 1947, and ordered the transfer of all military and civilian personnel of the Army Air Forces to the Department of the Air Force and the USAF. ^ "Air Corps or Air Forces?". AAFHA. Retrieved 14 April 2018. ^ Nalty (1997), pp. 176 and 378. Also, see growth tables above. ^ AAF Statistical Digest, Table 215 – Airfields in CONUS 1941–1945; Table 217 – Airfields outside CONUS 1941–1945. ^ Nalty (1997), p. 112-113. ^ Nalty (1997), p. 131-133. ^ Craven and Cate, Vol. 6, pp. 17–18. ^ a b Nalty (1997), p.181. ^ Nalty (1997), p. 179-181. ^ a b McClendon (1996), pp. 132–141. The three documents referenced, AR 95-5, EO 9082, and WD Circular 59, are reproduced in their entirety. ^ Correll, "GHQ Air Force", p.68. ^ Cline (1990), p. 92. ^ a b Mooney and Williamson (1956), pp. 29, 33, 40, 41, 43, and 68. ^ Mooney and Williamson (1956), pp. 61–62. ^ Correll, "But What About the Air Corps? ", pp. 64–65. ^ Futrell, Historical Study 69, pp. 2–7. ^ Ingersoll, Ralph (1940). Report on England, November 1940. New York: Simon and Schuster. pp. 139, 156–157. ^ Tate (1998), p. 172. ^ Craven and Cate, Vol. 1, pp. 105–106. ^ a b "The Evolution of the Department of the Air Force". Air Force Historical Studies Office. Retrieved 11 October 2012. ^ Tate (1998), p. 189. ^ Nalty (1997), pp. 260–263. ^ Correll, "The US Army Air Forces at War", p.36. ^ Craven and Cate, Vol. 7, p.514. ^ Official Register of the United States 1941, Volume I, U.S. Civil Service Commission publication, p. 48. ^ Finney (1955), p. 25. ^ AAF Statistical Digest, Table 4 – Military Personnel in Continental U.S. and Overseas, By Type of Personnel. ^ Craven and Cate Vol. 6, pp. 141–142. ^ Craven and Cate Vol. 6, pp. 145 and 150. ^ Futrell, Historical Study 69, p.112. ^ Futrell, Historical Study 69, p.167. ^ Futrell, Historical Study 69, p.156. ^ Futrell, Historical Study 69, Chart I, p. 169. ^ AAF Statistical Digest, Table 217 – Airfields outside CONUS 1941–1945. ^ Craven and Cate, Vol. 1, p. 75. ^ a b c d Maurer, Combat Units, p. 8. ^ a b Craven and Cate, Vol. 6, p. 58. ^ Spaatz, "Strategic Airpower in the European War". ^ White (1949), p. 8. ^ a b Craven and Cate, Vol. 6, pp. 600–602. ^ White (1949), p. 15. ^ White (1949), pp. 17–18. ^ Maurer Combat Squadrons, v.
^ Bowman (1997), p. 113. ^ a b Griffith (1999), pp. 67. ^ a b Griffith (1999), pp. 96–97. ^ Griffith (1999), p. 66. ^ a b c Nalty (1997), p.188. ^ a b Nalty (1997), p.190. ^ a b Nalty (1997), p.268. ^ Correll, "The US Army Air Forces at War", p.34. ^ Correll, "The US Army Air Forces at war", p.33. ^ Correll, "The US Army Air Forces at War", p.32. ^ Nalty (1997), p. 378. ^ Futrell, Historical Study 69, p. 156. ^ Nalty (1997), p. 374. ^ Nalty (1997), p. 375. ^ Nalty (1997), p. 377. ^ "The Air Force Fact Sheet" (AF.mil) Retrieved 25 April 2016. ^ a b c "Records of the Army Air Forces (AAF)". National Archives. Retrieved 22 November 2010. ^ Nalty (1997), pp. 418–424. ^ Table of Equipment No. 21 1 September 1945 Part II (theater clothing zones). ^ a b AR 600-35 31 March 1944 (Section I, para. 2; Section II, para. 18). ^ Risch and Pitkin, p. 47. ^ a b AR 600-35 (Section I, para. 2a3). ^ AR 600-40 (Section 3, para. 39). ^ AR 600-35 31 March 1944 (Section I, para. 2; Section II, para. 9, 19). ^ Army Officers Guide 1942, pp. 132. ^ AR 600-35 (Section I, para. 2a2). ^ War Department Cir. No. 391 30 September 1944 Sec. VII. ^ AR 600-35 (para. 12). ^ a b Bowman (1997), p. 171. ^ Risch and Pitkin, p. 80,81. ^ Daly-Benarek (1995), p. 27. ^ Smith (2001), p. 241. ^ Bowman (1997), p. 172. ^ Smith (2001), pp. 244–246. ^ Risch and Pitkin, p. .
^ Bowman (1997), p. 156. Reproduction of relevant page from The Officer's Guide, July 1943. ^ Up from Kittyhawk Chronology 1903–1979. airforce-magazine.com. Retrieved 9 October 2012. ^ Rottman (1998), p. 54. ^ "How did Air Force shoulder sleeve insignia develop?". Air Force Historical Studies Office. Retrieved 11 October 2012. McClendon, R. Earl (1996). Autonomy of the Air Arm (PDF). Maxwell Air Force Base, Alabama: Air University. ISBN 978-0-16-045510-0. Retrieved 31 May 2012. Tate, Dr. James P. (1998). The Army and its Air Corps: Army Policy Toward Aviation 1919–1941. Maxwell Air Force Base, AL: Air University Press. ISBN 978-0-16-061379-1. Wolk, Herman S. (1996). 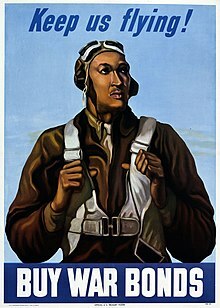 Toward Independence: The Emergence of the U.S. Air Force 1945–1947[permanent dead link]. Air Force History and Museums Program Air Force History Support Office. Bolling AFB, D.C.